Click here for a brief history of the Kansas Canoe & Kayak Association (KCKA), membership form, member discounts, benefits, and articles on the sad state of river access in Kansas. The Kansas Canoe & Kayak Association (KCKA), organized April 26, 1975, is a Kansas Not-For-Profit Corporation. KCKA, with nearly 200 family member paddlers, is an organization of canoeists, kayakers, and rafters working together to promote river running and related activities. KCKA is the oldest and largest canoe/kayak/rafting club in Kansas dedicated to a mission of providing education and recreational opportunities for Kansas paddlers. THE KANSAS PADDLER HOMEPAGE has been the home of the Kansas Canoe & Kayak Association since December 1995. THE KANSAS PADDLER has logged well over 130,000 visits [to date] and requests for maps, river information, and advice on paddling rivers in Kansas. KCKA maintains regular communication through its newsletter and email list to well over 1,500 club and non-club visitors interested in paddling rivers in Kansas. 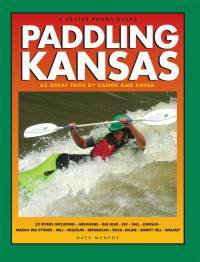 PADDLING KANSAS, 176 pages on publicly accessible canoe & kayak routes - by Kansas Canoe & Kayak Member, Dave Murphy now out! Under urban conditions, when watersheds become increasingly covered with impervious surfaces such as houses, streets, parking lots, and other forms of urban development, storm water runoff increases along with bank full flow frequency. Addition runoff that occurs from rainfall events increases bank full flow, which often causes an increase in channel width and/or depth. Kansas Water Office, Kansas Department of Health and Environment, Kansas Biological Survey, Kansas Geologic Survey, Kansas Department of Wildlife and Parks, Natural Resources Conservation Service, U. S. Army Corps of Engineers, Kansas Department of Agriculture - Division of Water Resources, Kansas Forest Service, State Conservation Commission, U. S. Fish and Wildlife Service, Environmental Protection Agency, and other resources. The Webmaster at "work" on his favorite streams!! !